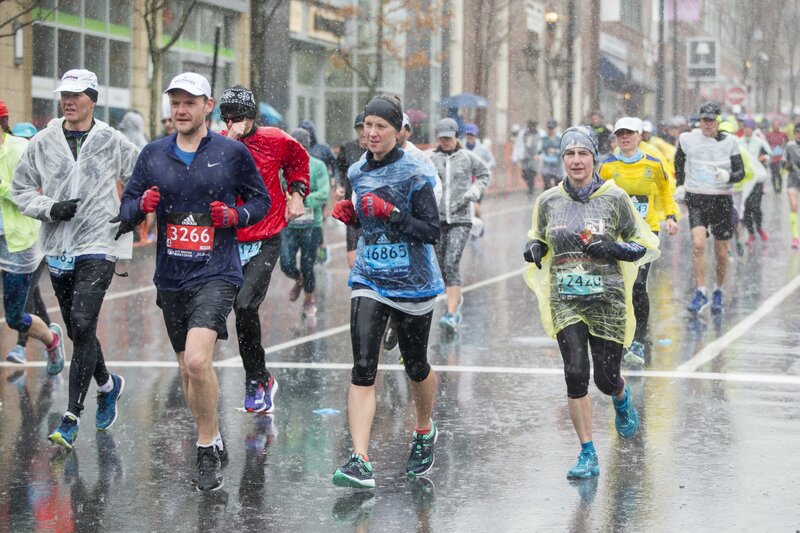 The Boston Marathon was off to a rainy start Monday morning for the participants who were starting their 26.2 miles run from Hopkinton, Massachusetts. Marathon day is a holiday in Massachusetts where people line the streets to cheer on athletes participating in the race. The first wave of athletes was scheduled to start off the race at 9:02 a.m. EDT with waves following them through 11:15 a.m. Weather at the starting line when the race began was about 55 degrees Fahrenheit and temperatures were expected to reach the high 60s as the day progressed. Coverage was also scheduled to be available from NBC Sports and there were some individuals who had live streams as well from the sidelines. There are several ways for fans to track their friends, family or favorite Boston Marathoner. They can either follow them manually online or they can sign up for text alerts that will notify them when the participant reaches certain markers in the race. To sign up for text alerts, fans can go to the Boston Athletic Association’s website and select the AT&T Athlete Alerts section. There they can see the directions and details or signing up for alerts. They can also text RUNNER to 234567 to start the registration process. From there they’ll need the bib number of the participant they want to track. Another way to track a participant is to go to the BAA website and scroll down to the results section. There’s a tab that says “tracking” where users can then type in the runner or participant’s last name and first name or their bib number to track them. This option also shows a detailed map of the marathon route. The final way people can track an athlete is through the BAA Boston Marathon App. That app features information about the course, the race and tracking as well. Fans of the marathon or its participants can also follow along on social media where the BAA is providing frequent updates, including photos, videos and leaderboard information. The full course, expected participant arrival times and the best places to watch in the towns the marathon crosses through were all available online as well.